Lucideon works with a broad range of manufacturers producing turbine blades and other hot gas path components, providing support in the development and qualification of new and robust material solutions. With our expertise, technology and experience, we'll work with you to ensure your products and materials meet or exceed industry standards. Lucideon holds a wide range of industry accreditations, including Nadcap, ISO 17025 and 10 CFR 50 Appendix B. Our team develops custom metallographic procedures to ensure coated and uncoated specimens are prepared consistently, thus allowing the focus to remain on providing a representative evaluation which can correlate to your historical data. Application: Imaging and inspection of recast layer after EDM machining of turbine blade features. Lucideon uses scanning electron microscopy (SEM) to evaluate materials at magnifications in excess of 100,000x. Our expert metallurgists and ceramists leverage this technology to characterize material microstructures, identify defects and perform forensic failure investigations. Application: Analysis of casting defects detected during NDT inspections. EBSD is a microstructural-crystallographic characterization technique which is used to understand the crystal structure of a material. This technique can be used to assess the directionality of superalloy materials, as well as identify texture, grain morphology, and regions of plastic deformation. Application: Troubleshooting processing issues in investment castings. 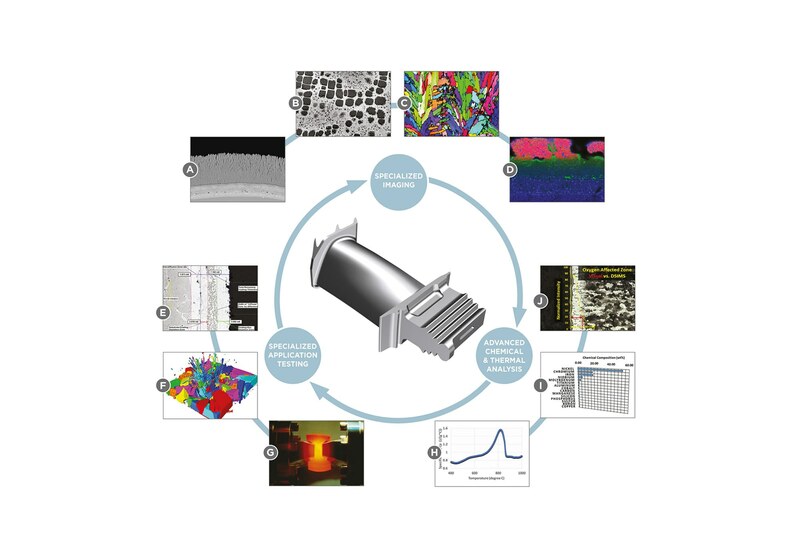 Lucideon utilizes a state-of-the-art electron microprobe system with wavelength dispersive spectroscopy (WDS) in order to provide spot scans, depth profiling, and elemental mapping of advanced superalloys and their coatings, at a level unavailable using even the most advanced energy dispersive x-ray spectroscopy (EDS). Application: Mapping of aluminum concentrations in PtAl bond coatings for thermal barrier coatings (TBCs). Encountering surface contamination and need to know how deep the problem goes? Dynamic secondary ion mass spectroscopy (DSIMS) uses a focused ion beam to profile into the surface of a material, while simultaneously capturing composition information. Application: Depth determination of oxygen enriched zone in titanium alloys. Understanding the performance of high temperature alloys at operating conditions is critical to ensuring the safety and longevity of hot gas path components. Lucideon has six burner rig furnaces on-site which allow customizable oxidation atmospheres above 2,000°F, with ability for static and cyclic testing. Full metallurgical characterization and consulting available. Application: Benchmarking of new metal AM alloys against legacy materials. Development of next generation thermal and environmental barrier coatings requires accelerated testing under conditions at, or exceeding, the edge of the design envelope. Lucideon can offer customized test programs to best meet your test needs. Application: Benchmarking of candidate EBC coatings under application specific conditions. The development of new high temperature and high strength alloys is at the core of enabling efficiencies in the aviation industry. These material advances are enabled through the use of thermal-mechanical simulations, such as Gleeble, which allow the characterization of properties such as hot ductility, flow stress, and weldability. Lucideon is the only ISO 17025 compliant laboratory in the North America to offer Gleeble testing on a toll basis. Application: Simulation of heat treatment profiles and their effect on mechanical performance. Lucideon uses state-of-the-art instruments to determine the thermal and thermo-mechanical properties for high temperature ceramic coatings and their underlying superalloys. These techniques include thermal conductivity, specific heat and thermal expansion up to 1,600°C. Application: Thermal characterization of EBC or TBC coatings beyond operating temperatures. Our experts are backed by a full in-house suite of capabilities to support characterization of chemical and structural material information. These techniques include x-ray diffraction (XRD), x-ray fluorescence (XRF), inductively coupled plasma optical emission spectroscopy (ICP-OES), and inert gas fusion (IGF) and combustion analysis. Application: Troubleshooting of variability in EB-PVD ingots for TBC coatings.